For those of you in Atlanta (or willing to make the drive into town), a little reminder that this Tuesday May 7th is the Peachtree Battle Friends Spring Home Tour. After a one year hiatus, this wonderful tour is back, and the funds raised go directly to one of my favorite causes, Children’s Healthcare of Atlanta. Although I have not seen the inside of the houses yet, I was given permission to take a few exterior pictures as an enticing preview of the tour. The house information is adapted from the brochure that is available on the day of the tour. This charming house was built in 1928, and has had only four owners. The current owners have transformed the traditional cottage into a comfortable family home with a modern edge. Complimenting the timeless architecture of the home is the owners’ diverse art collection. The collection consists primarily of photography and paintings, and includes many photographs by the owner, photographer Angela West. For the interiors, the homeowners worked with designer Sara Steinfeld to capture their vision for a ‘contemporary cottage’ home. Throughout this artistic home, you will enjoy seeing the homeowners’ eye for beauty through their art collection and all of the home’s details. A view of the charming bridge at the entry of the property. This property feels like a bit of the county in the middle of Buckhead; the lot encompasses almost two acres and has formal, vegetable, and herb gardens in the outdoor space design. The homeowners use the gardens as an extension of their living space, and spend as much time outdoors as in. A few years ago, I took pictures of a house that was on one of my favorite routes for walking my dog. 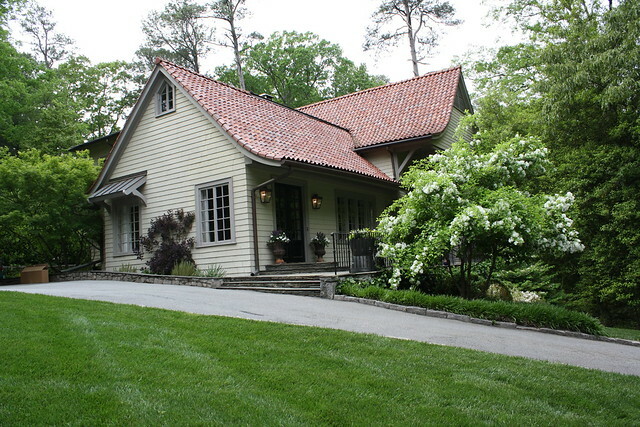 I wrote a blog post about it here - http://www.thingsthatinspire.net/2010/09/beautiful-atlanta-renovation.html. It was remarkable for me to see the complete transformation of the house and the lot; Spitzmiller & Norris were the architects who guided the renovation of the exterior in 2009, and aspects of the interior in 2011 (primarily, the conversion of an upstairs sitting porch into an additional bedroom and bathroom, and an excavation and renovation of the basement into a playroom and sitting area, a laundry, bathroom, and wine cellar). 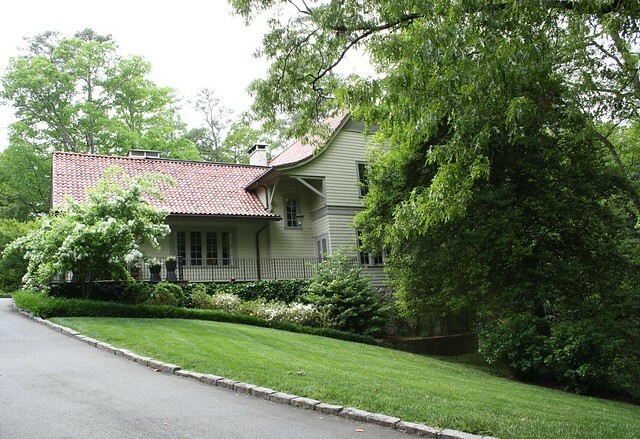 I was delighted to discover that this house will be on the 2013 Peachtree Battle Friends Spring Home Tour, and I am looking forward to seeing the inside! Here is a quick picture of the house as it appeared last week; the landscaping has grown in beautifully and the house looks wonderful (when I drove by late last week, there was a full crew of landscapers at work, tweaking and perfecting the property in time for the tour!). For the interiors of the house, the homeowners sought to embrace existing features of the home, including the abundant natural light, and incorporate fabrics and furnishings to achieve a fresh but relaxed atmosphere for the family. Walter Mazzatini of Abitato, Inc and Woody Yeomans of Mrs. Howard each provided valuable assistance in helping the family achieve their vision for the interior. This classic French style house was built in 1993 and designed by Spitzmiller & Norris; it was designed to emphasize classic symmetry, scale, and timeless detail. In recent years, the house was sold and the new homeowners enlisted Spitzmiller & Norris to update the house for 21st century living and style. The architectural integrity of the design was maintained, and significant updates were made to the kitchen and master bathroom. Beth Ervin of Beth Ervin Interiors was hired to help with finishes and paint colors. Another significant renovation and addition occurred outside. A large outdoor living area was designed, which includes a saltwater pool, terrace, and pool cabana. Landscape designer Graham Pittman along with Caroline Rolander of Reu Architects worked on the design of the new outdoor spaces. 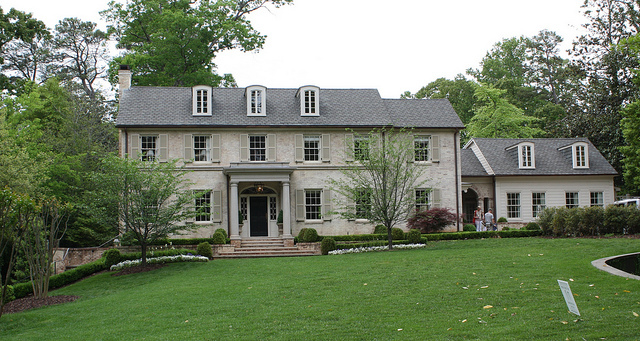 This eight year old “English Country Manor” style house was designed by architect Yong Pak, with the goal of being unique to the Haynes Manor neighborhood, but appropriate in scale and design to its neighbors. 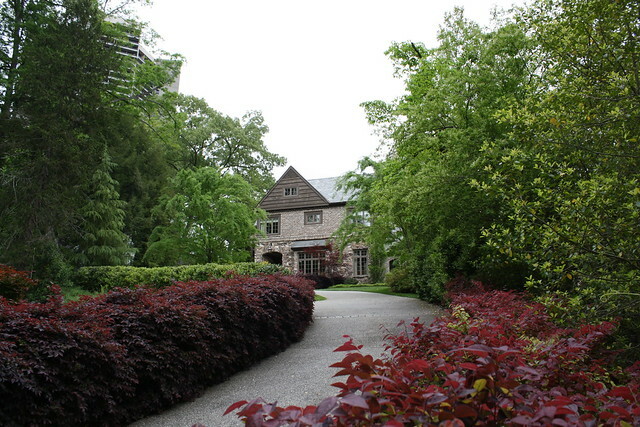 A view from further down the driveway reveals the rear neighbor, a residential high rise on Peachtree Road. The design of the house was specifically geared towards creating an intimate environment inside and out that would ‘turn away’ from the high rise. The result is a house that has beautiful scale and sits at ease in its lot and in the neighborhood, but with the majority of the rooms facing a side courtyard with Southern exposure, allowing extensive light throughout the house and a very private feel. The homeowners are avid collectors of art, and in particular have an affinity for figurative contemporary art. Homeowner Molly Mears co-founded The Art Connection, an art consulting company, and assists clients in furnishing their own homes with art. I couldn’t resist including this charming view of the entry to the property, which begins with a small bridge flanked by lanterns. The driveway curves up the front entrance, creating a sense of anticipation for what is to come. I am really looking forward to seeing this house (and all of the houses on the tour). For more information on the tour, please visit http://www.choa.org/hometour. Tickets are available at any of the houses on the day of the tour, for $30 each (all proceeds go the Children’s Healthcare of Atlanta). 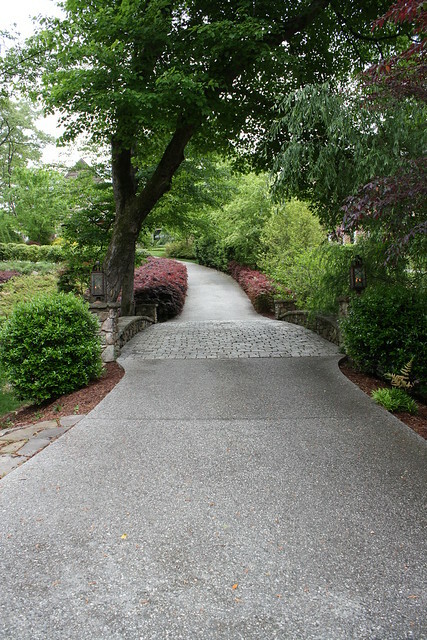 As always, I highly recommend wearing comfortable shoes – several of these houses have classic Atlanta driveways that are steep and require sure footing. Please join Peachtree Battle Friends for the annual Peachtree Battle Home Tour Tuesday, May 7, 2013. Patrons will have the pleasure of touring four beautiful homes in the Peachtree Battle neighborhood. This is an event not to be missed. $30 per person day of tour purchased at any of the homes. Our House and Garden Tour locations. Note: You may begin at any of the homes. Thanks for showing these beautiful exteriors. You are correct though, it is torture for those of us not local to Atlanta! I hope you'll be able to show us a bit of the interiors of these homes. Can't wait to hear all about the tour! I agree Holly please post a few interior pics I am so intrigued!! These houses all look well scaled, not huge mega mansions. I already have my tickets for the tour! I can't wait. I just love this type of tour. The homes are amazing, and like you, I just love looking at the architecture of a home. I wish the first home was not hidden by that tree on the right. 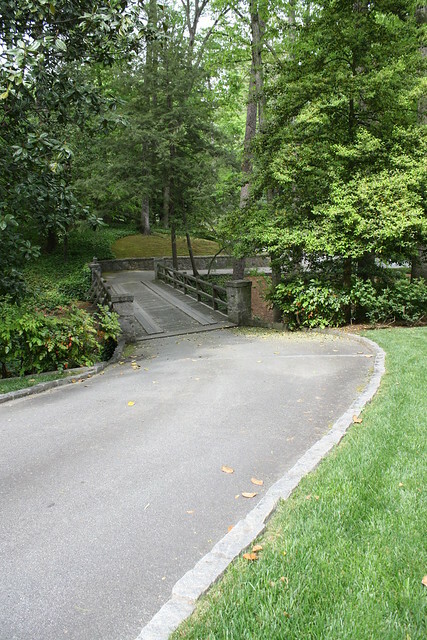 I love the sweet bridges, and can only imagine what the approach to the home feels like. Thanks TTI, I've managed to miss every one of these. Maybe this time. So wish I was closer..love home tours and these all look amazing, beautiful stately homes. Enjoy! These houses are gorgeous and in my neighborhood! Too bad I can't attend the tour....the day job calls. Please post pictures from the interiors (if you allowed to take them). Have a good one! What a great way to spend a day and enjoy all the wonders of design. It was a great tour - thank you for letting us know about it! The houses were each beautifully decorated, very manageable in size, and had wonderful ideas for decorating and living with style. Oh, I so wish I could make it to Atlanta for this tour! Atlanta has some of the most beautiful homes in the country, in my humble opinion. Thank you for taking us on a virtual tour!! Has that first house been published anywhere in the past? It looks SO familiar!